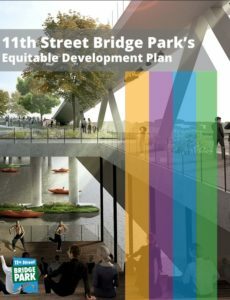 The 11th Street Bridge Park Equitable Development Plan was developed in 2015 following a year-long, community-led effort to ensure that nearby residents can benefit from this new civic space planned over the Anacostia River in Washington DC. The Plan was developed by the Park’s Equitable Development Task Force working alongside community residents, business owners, policy experts and government officials to identify actionable recommendations that the Bridge Park and its partners can take in three areas: workforce development, small business enterprise and housing. Updated in 2018, the plan now includes arts and culture as another key strategy. The new document also includes a summary of lessons learned in the last several years of implementation.